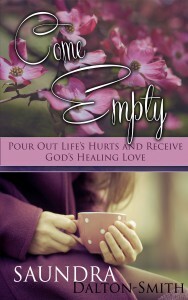 SACRED REST reveals why rest can no longer remain optional for those desiring their best life. 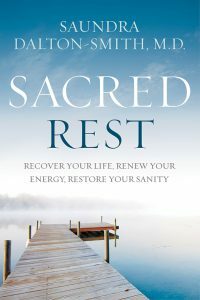 Written for those who go to bed tired and wake up still exhausted, SACRED REST helps the overwhelmed identify what kind of rest they have been missing. Dr. Dalton-Smith shares seven unique types of rest she has found lacking in the lives of those she encounters in her clinical practice and research – physical, mental, spiritual, emotional, sensory, social, creative – and why a deficiency in any one of these types of rest can have unfavorable effects on your happiness, relationships, creativity, and productivity. These types of rest have never before been shared in this context, combining the science of rest, the spirituality of rest, the gifts of rest, and the resulting fruit of rest. It shows rest as something sacred, valuable, and worthy of our respect. 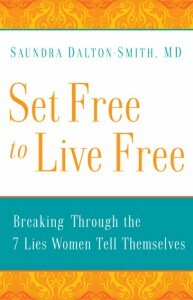 In Set Free to Live Free: Breaking Through the 7 Lies Women Tell Themselves, Saundra Dalton-Smith shows women how to break free from seven mental ties that hold them back, including striving for perfection, comparing themselves to others, all-or-nothing attitudes, and more. Through case studies and inspirational writing, she encourages women to embrace spontaneity, be transparent, nurture their bodies, and cultivate a balanced life.